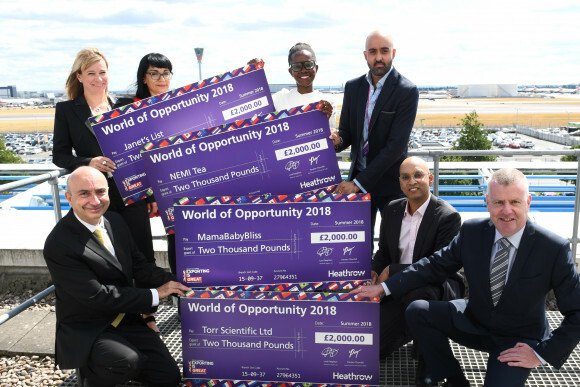 LONDON, UK, 2018-Aug-24 — /Travel PR News/ — Heathrow has revealed the 20 winners of this year’s World of Opportunity Programme. This years’ winners include outstanding companies that support refugee learning programmes, gourmet crisp producers and a family run cycling business. The programme, now in its second year, sees Heathrow working in partnership with the Department for International Trade’s (DIT) ‘Exporting is GREAT Campaign’, to award each SME £2,000 to fund their trade missions as they look to expand their businesses abroad. In addition to receiving the grant, the winners will be offered guidance from DIT International Trade Advisers and may even be put in contact with other international networks that will be able to assist them as they look to establish themselves in markets further afield. When departing from Heathrow, these businesses will also be given a Plaza Premium lounge pass for their travels. The ‘World of Opportunity Programme’ ran from 8 June – 14 July of this year. Nearly 150 applications were received, and the winning entries were chosen by a panel of experts including Heathrow Chairman Lord Deighton and Parveen Thornhill, London and Devolved Administration Director for the Department of International Trade. “We’re delighted to have partnered with Heathrow once again on the World of Opportunity Programme. With last year’s winning SMEs going on to secure major export wins in markets across the globe, we look forward to supporting the success of this year’s cohort. Heathrow is Europe’s largest airport and one of the world’s top international aviation hubs. As the UK’s global gateway, Heathrow welcomes more than 78 million passengers every year with a commitment to making ‘every journey better’, and in 2017, handled over 1.7m tonnes of cargo as the nation’s biggest port by value for markets outside the EU and Switzerland. The airport is home to more than 80 airlines and helps to drive British trade growth by connecting the nation to more than 200 destinations around the world. Following an investment of more than £11 billion over the last 10 years, Heathrow is currently ranked by passengers as the ‘Best Airport in Western Europe’ for the fourth year running and the ‘Best Airport for Shopping’ for nine years in a row. This entry was posted in Airports, Business, Travel, Travelers and tagged Baroness Fairhead, Emma Gilthorpe, Heathrow, Lord Deighton, Opportunity Programme, Parveen Thornhill, winners. Bookmark the permalink.